Aged twentyone I happened to be taken to the local arts cinema to see a movie called L'amour en fuite - written and directed by Francois Truffaud. It made a big impression on me - I fear mostly for the worst reasons! But it led to a couple of years in which I would go and see just about any French movie (with subtitles, of course), especially from New Wave directors, culminating in a couple of visits to Paris in my middle twenties. 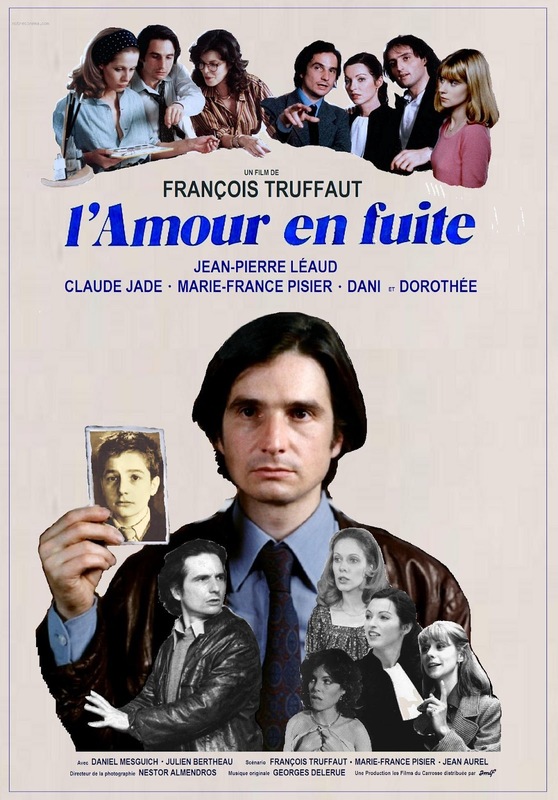 From scores I watched, I probably thoroughly-enjoyed about three of these films - and I don't enjoy any of them now (L'amour en fuite seems painfully clumsy and clunky! ); but I kept on going back, hoping to recapture whatever-it-was. The word that sums-up this era is pretentious. I don't say that the French movies were to blame for this, nor were they the only element; but the fact is that I did have a secret, rather ashamed, fantasy life about being the kind of alter-ego hero which the French directors (always?) put into their movies - a famous but pleasantly-tormented artistic genus who has elfin women throwing themselves at him - and who always yields in the end, after due examination of conscience. Or else who is obsessed by some initially-reluctant gamine creature - and who always yields in the end, after due examination of conscience. In retrospect, I can see that my would-be or actual girlfriends at this time were often selected somewhat on this basis - as potentially fitting-into this general milieu either psychologically or visually (with predictably unsatisfactory consequences; mostly - of course - for them. Sorry!). All this against a backdrop (maybe monochrome?) of cafes, bars, restaurants, bookshops, Citroen DS cars and Le Metro. This was about not merely being 'an intellectual' but being a public intellectual - in the sense of doing one's thinking and writing in public, on display (for admiration, implicitly) - presumably seated at the table of some pavement café on the Left Bank.... Being covertly photographed by tourists perhaps? So, there was nothing very noble or sophisticated about my French Phase - it was wishful thinking of the most unrealistic and hedonistic type. The idea of the public intellectual has moved from the cafes to social media. Anyone on facebook or tumblr can find many indoctrinated, low-information twits making constant posts for admiration. But in this forum, there is no independent thought or rigor. So it's all still there, just much more heightened! That is true for almost everyone though, especially women. They base their lives and mating on tropes from movies too - that's likely why they were with you! I find the fact that the French could produce such themes so often to be somewhat charming and increasingly archaic. What will be next? Somehow I don't see how being harassed by the chaotics created by the corrupt elite will make such light-hearted comedies. The French have really done themselves in! Again! I think that almost everyone looks back at the person they were in their youth with elements of deep embarrassment, bemusement, shock and gratitude that they made it through that period. I should know I almost got shot playing what I thought was a very funny practical joke when I was 19. "I have a really great idea", are terrifying words when uttered by most 16 - 22 year old males in Western society. If you are past that point you are on the road to being an evolutionary successful man. One thing Truffaut was *far* more right about than he knew was that 'Women are magic'. @Stephen - Of course we should forgive repented wrongdoings, including our own - but that era was part of a long, elaborate, and destructive evasion of the realities of life - so I am not inclined to excuse it! I think it's the pride and the magic of the youth. Being somewhat younger than you, I didn't knew Truffaut and the "Nouvelle Vague". But, as a young man, I had these fantasies with delusions of grandeur. I wanted to be famous, a respected intellectual or an important authority. I daydreamed about that. Now this seems nonsense to me. If I was offered the chance of being famous, I wouldn't take it. However, it is remembered with longing for these days, when life was new and sweet, and full of possibilities, illusions and future, before the illnesses, before the tragedies, before getting old and fat, before the noonday devil, before noticing that time runs out. I understand, Bruce. I guess if I had wife and kids (which is my desire), I wouldn't trade them for anything in the world. So I am glad for you and I know you know that you must thank God for this blessing.